Premium Bandai has officially released the images price and release date for Kamen Riders Grease Blizzard and Mad Rogue! 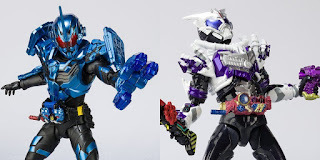 Both SHFs are priced at 6264 Yen, and will also be released together in April 2019. See the full images below! Grease Blizzard Comes with replaceable right hand parts, a Blizzard Full Bottle, and the Blizzard Knuckle can be removed from the belt to be used as a weapon! Mad Rogue includes replaceable hands, a Nebula Steamgun, and Steam Blade.